The VCTC Finance Department strives to run an efficient and fiscally responsible department. Finance produces timely and accurate reports to provide the Commission and the public financial information about VCTC’s operations. The Finance Department is responsible for performing the day-to-day accounting functions consisting of cash management, accounts receivable, accounts payable, payroll, general ledger, financial reports and investment reports for seven funds: a general fund; four special revenue funds, Service Authority for Freeway Emergencies (SAFE), Santa Paula Branch Line (SPBL), Local Transportation Fund (LTF) and State Transit Assistance (STA); and two proprietary funds, VCTC Intercity and Valley Express. The Finance Department prepares and monitors the agency’s budget, provides budgetary assistance to project managers who monitor individual task budgets, and provides grant support and specific project support as needed. The Finance Department is also in charge of multiple audits and overseeing financial compliance with various state and federal regulations. The Finance Department prepares and publishes several financial reports annually. The current version of each is listed below. Simply click on the title or image of the publication to download file in a .pdf format. 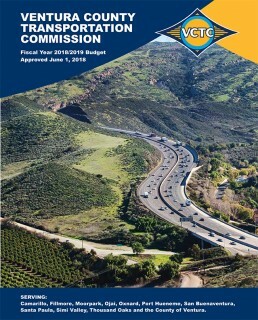 Each year, VCTC’s Finance Department prepares a comprehensive Annual Budget itemizing revenues, expenditures, and investments for the upcoming fiscal year. 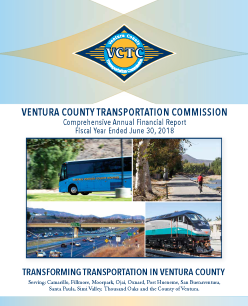 Program budgets include objectives and accomplishments at the task level for each of VCTC’s six programs: Transit and Transportation, Highways, Rail, Commuter Assistance, Planning and Programming, and General Governance. The Annual Budget is presented to the Commission each April and typically adopted the following June. 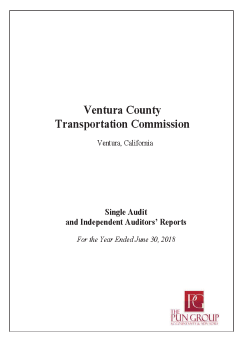 The State of California requires the Ventura County Transportation Commission (VCTC) to prepare annual financial statements in accordance with generally accepted accounting principles (GAAP). The financial statements are then audited by independent certified public accountants. The VCTC goes beyond the minimum established requirements and produces a Comprehensive Annual Financial Report (CAFR). The CAFR is designed to provide a complete financial picture of the agency and includes the independent auditors’ report, a management discussion, the audited financial statements as well as supplementary information including budget results and statistical information. The Comptroller General of the United States requires that VCTC comply with OMB Circular A-133, Audits of States, Local Governments, and Non-Profit Organizations. To comply, VCTC prepares an annual Single Audit Report on Federal Awards which is audited by an independent certified public accounting firm.